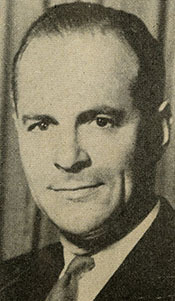 LODGE, John Davis, (grandson of Henry Cabot Lodge, brother of Henry Cabot Lodge, Jr., and nephew of Augustus P. Gardner), a Representative from Connecticut; born in Washington, D.C., October 20, 1903; attended the Evans School, Mesa, Ariz., the Middlesex School, Concord, Mass., and Ecole de Droit, Paris, France; was graduated from Harvard University in 1925 and from the Harvard Law School in 1929; was admitted to the New York bar in 1932 and commenced practice in New York City; affiliated with the motion-picture industry and the theater 1933-1942; served with the United States Navy as a lieutenant and lieutenant commander August 1942 to January 1946 and was a liaison officer between the French and American fleets; was decorated with the rank of Chevalier in the French Legion of Honor and with the Croix de Guerre with palm by General de Gaulle; engaged in research work in economics; elected as a Republican to the Eightieth and Eighty-first Congresses (January 3, 1947-January 3, 1951); was not a candidate for renomination in 1950; Governor of Connecticut from January 1951 to January 1955; unsuccessful for reelection as Governor in 1954; United States Ambassador to Spain from January 1955 until January 1961; National president, Junior Achievement, Inc., 1963-1964; chairman, Committee Foreign Policy Research Institute, University of Pennsylvania, 1964-1969; delegate and assistant floor leader, Connecticut Constitutional Convention, in 1965; United States Ambassador to Argentina, 1969 to 1974; Ambassador to Switzerland, 1983; was a resident of Westport, Conn. until his death in New York City, October 29, 1985; interment in Arlington National Cemetery. DeLong, Thomas A. John Davis Lodge: A Life In Three Acts: Actor, Politician, Diplomat. Fairfield, CT: Sacred Heart University Press, 1999.